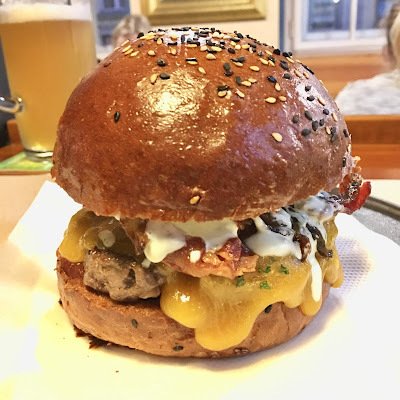 Welcome to my 10th annual ranking of the burgers of Prague. Let's dig in. Every year, I must explain that this is not a list of "the best." That's a subjective distinction others may presume to make. So, what do I look for? High-quality beef, coarsely ground, cooked medium, with a fat content around 20 percent is a good starting point. I prefer a patty that is flame-grilled or griddled with a seared crust, and liberally salted on the exterior. I want lightly crisp (but not brittle), smoked bacon. Toppings are better on the top or the side and should be sliced thin. On the bottom, they get warm and soggy. Well-balanced construction doesn't just make a burger look good. It also helps it taste good and makes it easier to pick up and bite. It's no fun to have half your meal fall out the back side of the bun. Awkward lettuce is particularly annoying. Shredded is preferred. Don't underestimate the importance of buns. They should be toasted or grilled rather than baked. They must maintain structural integrity from first bite to last, but also be light, not dense. The burgers were rated as I experienced them. If they got better or worse the week after I was there, and you have a different opinion, that’s great. I'd love to hear it. But remember, you didn’t eat the burger I ate on the day I was there. This burger was automatically demoted to last place because of the restaurant's horrifying health inspection fail in October. The photos and descriptions in this report are not for the faint of heart or the weak of stomach. The owner said he was shocked – shocked – discover that his employees had been so careless. He claimed to have fired everyone and gone back into the kitchen himself – attempting to dodge personal responsibility. And this was the guy who started Prague's lucrative annual Burgerfest, now sponsored by Jack Daniels. Bejzment burgers were always hit and miss. This year, D Bejkn Čyz Burger (269 CZK without fries) was mediocre, with overground, oversalted beef, undersized bacon, and sad, wilted onions. It would have been in the lower middle of the burger pack, but the fact remains that I ate here before this dire health situation was revealed. I can't uneat that burger, and I can't unsee that disturbing report. It's unforgivable. Bejzment is forever banished. Slick photos on Instagram lured me for this burger, but IRL, it was terrible. The ground beef was super dense and chewy, and yet bright red inside. I'm not sure how they achieved that. The bun was surprisingly hard to bite. The meat slid out as I tried to eat it. My notes say "nasty." To their credit, they announced a total revamp of their burger after I posted about it back in March, but I have not been back since. 95 CZK without fries. 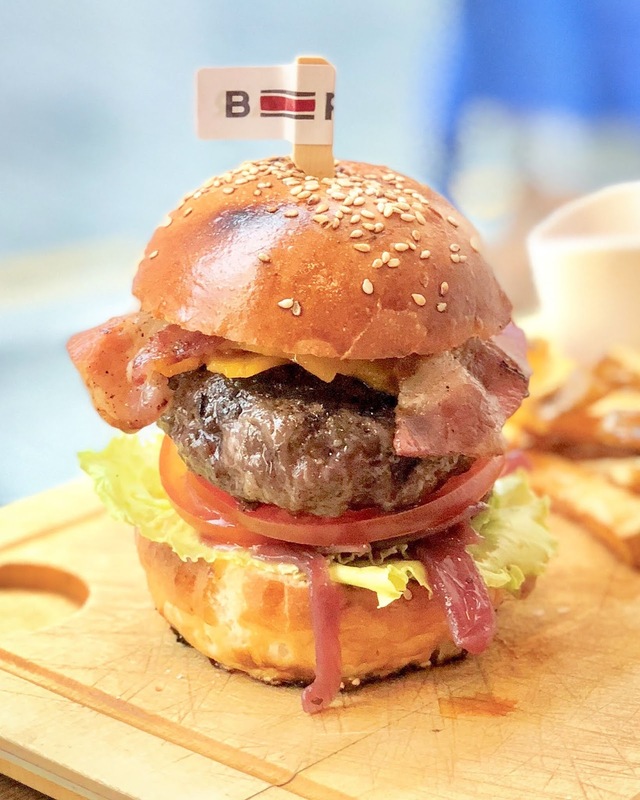 According to their website, their new burger is 155 CZK and includes fries. I like some of the Mexican food at Agave. I like their bar's style and cool lighting and sometimes enjoy a frozen margarita there. Since the place is American owned, I thought their Hamburguesa might be good, but my high hopes were laid low by the rubbery, dense, salty patty. It tasted OK, but the texture was all wrong. The huge patty, cooked medium, was served on a non-standard, crumbly bun. It gradually fell apart in my hands, turning into a big mess. It was served with good, tangy guacamole, grilled onions, lettuce tomato, Monterey Jack, and jalapeños. The spicy pickle on top was an odd choice. It was served with soft sweet potato fries for 275 CZK. Every year, Burger King is on the list and not because it is good. Among fast food burgers, I used to prefer it. Now, I'm beginning to loathe it. Here, it acts as a “control.” It’s a known quantity, though perhaps not quality. 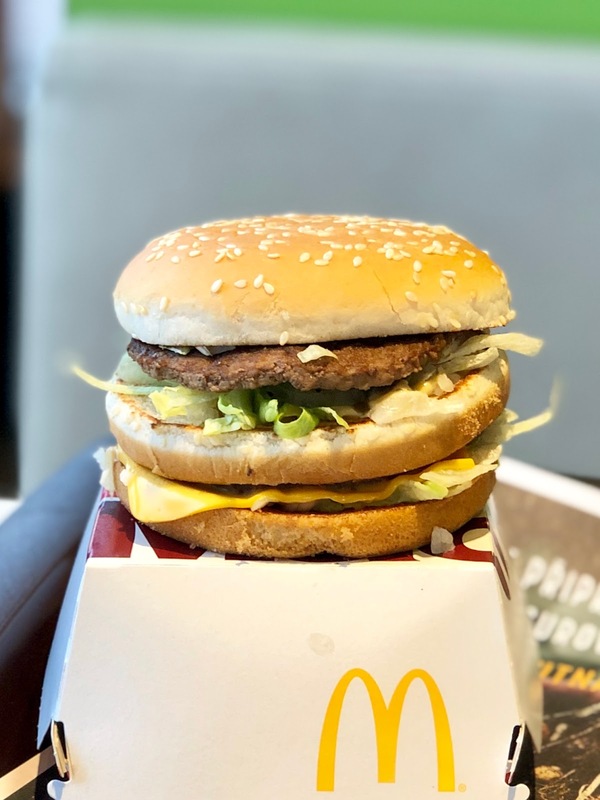 My point is this: If I like a BK burger more than the offering at a real, full-service restaurant, the owners and cooks should rethink what they are doing. It is also on the list to annoy the humorless people who take these things too seriously. This year, I got the Bacon King. The beef was overground, and the smoke flavor tasted fake. It was on a crappy, mushy, untoasted bun. It looked absolutely nothing like the photo on the overhead menu. Bleh. 139 CZK. I ordered the House Classic but was served The Hot Pepper burger with its signature red bun. The salty, peppery ground beef was cooked all the way through instead of medium, but had a good grind. The processed cheese was not well melted. It came with unremarkable bacon, pickles, tomatoes, jalapenos, and dressing. The fried onions with too much vinegar were unpleasant. It was tall and stiff. 185 CZK, served with decent fries and, oddly, Mexican-style salsa. 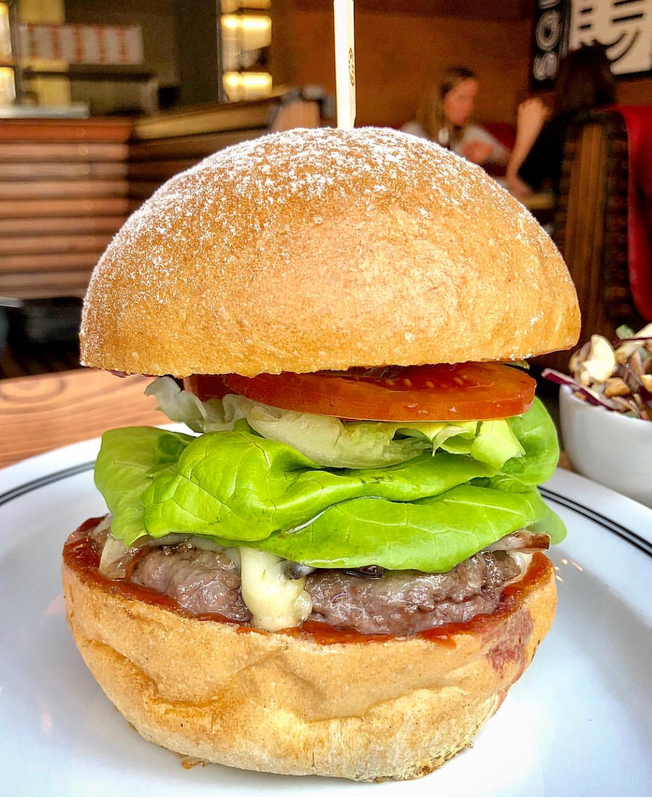 The Sailor Jerry Bacon Jam Burger featured good beef with a good grind. However, it was dense, overcooked, too tightly packed, and needed more salt. The bun was cold and doughy, not toasted. The cheddar/Eidam on top was not fully melted. The star here was the smoky bacon jam. It really elevated the whole thing. The burger also had lettuce, tomato, and raw red onions. The fries were a disaster. The potatoes glistened with hot grease and were not properly cooked through, with a snappy, veggie texture. This burger has many fans, but I am not one of them. My notes on the burger say: "Needs improvement." They served it with a bottle of Heinz ketchup, which is a great thing that all places should do. 248 CZK. Last things first: It took almost an hour for my order to be delivered to the table. When it finally arrived, the burger had a dense patty with overground beef, but decent flavor. It came with quite basic cheese and hammy, smoky bacon, plus lettuce, tomato, and mayo. The bun was baked rather than toasted, which resulted in crumbling. It was cooked all the way through, not medium. My notes say: "Not bad, but not worth 299 CZK." However, the view of Old Town from their terrace in the summer is priceless. 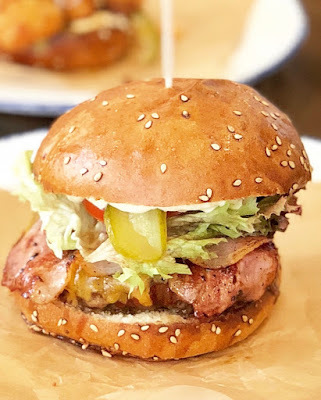 On a past list, I gave a good rating to the burger at their restaurant, Argument. 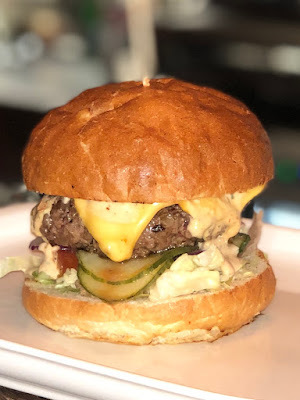 The burger they did at the Dejvice farmer's market on Saturdays was a different animal, so to speak. Although not as good as the restaurant's version, it was satisfying on a cold, rainy day in March. The salty patty had an enticing smoky flavor from the griddle, though it was rubbery from too fine a grind. It came with mayo, onion, red lettuce, and tomato. There was one strip of hammy bacon and tangy cheese on a good bun. 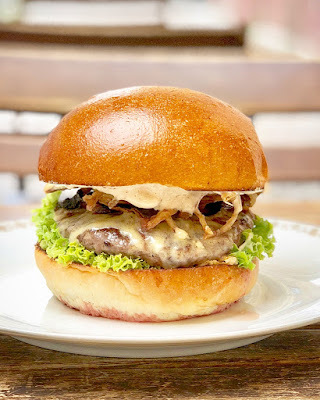 While the restaurant's superior burger costs 335 CZK, the outdoor version was just 100 CZK. 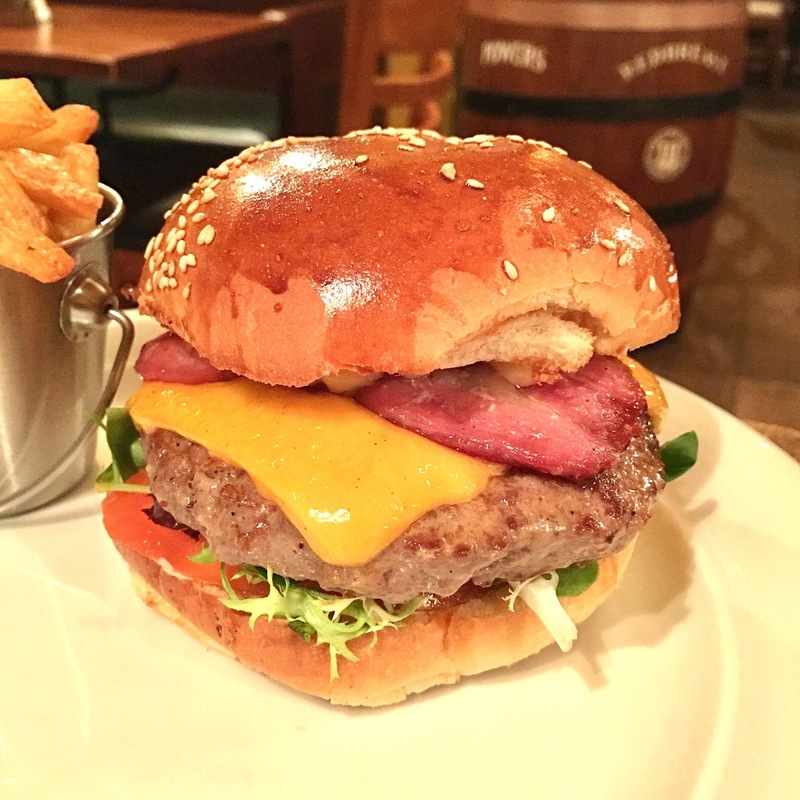 This is a high-end restaurant, serving a high-end burger for a high-end price. So why is it on the lower half of the list? The fine grind and low fat content of the beef hurt the texture. Aside from a strong hit of salt, the flavor of the meat was dull. 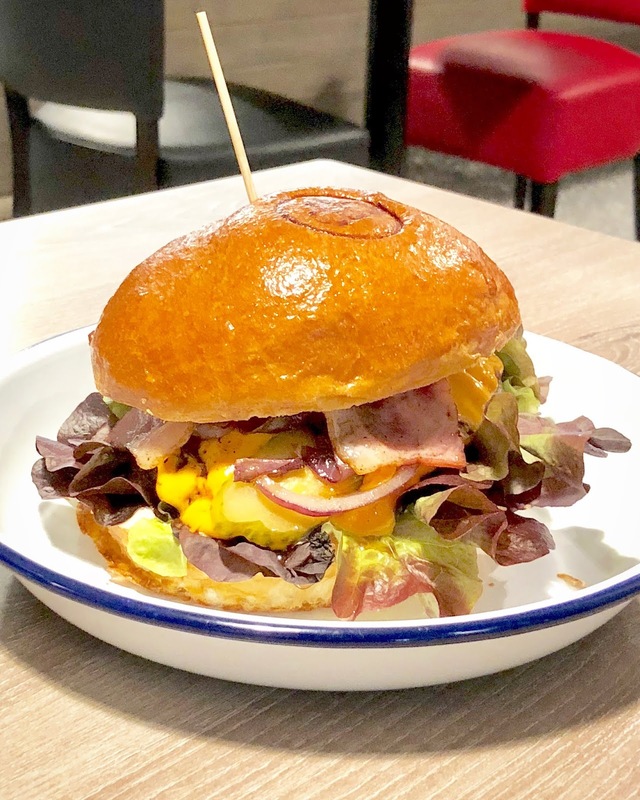 The brioche bun was unpleasantly dense and the bottom was soaked through with juices. The loss of liquid left the patty on the dry side. The burger was too heavy and hard to hold together. The highlight was the delicious, maple-glazed bacon. There was great, sharp cheddar. It was also topped with chipotle aioli, tomato, lots of shaved red onion, pickles, and lettuce. It came with beautifully-cut, light and crispy fries. The price weighed in at 395 CZK. I liked this burger better in previous years. There was good beef with a great, coarse grind, cooked medium. The smoky bacon was overcooked to a brittle state, but it did add lots of flavor, along with very salty cheese. Their special sauce was rather sweet. The main weakness here was the very tall bun. It had the fattest bottom half I have ever seen. Top and bottom were not well-toasted. A better bun would be a big improvement. 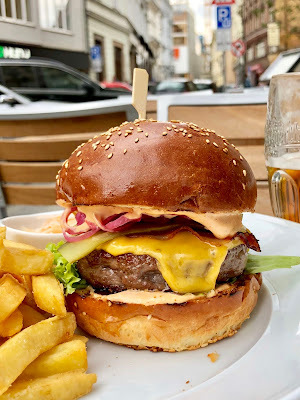 I had the large burger with the 170g patty for 119 CZK –- fries not included. Dish has topped my list twice over the years, but this year, they lost a step or two. The thin patty was cooked medium, but was bland. Toppings dominated: tons of garlic confit aioli, strong sour pickles, homemade ketchup reminiscent of tomato sauce, lettuce, salty bacon, and white cheddar. I'm not a fan of the bready roll they serve the burger on, but Dish always gets points for balanced construction. The patty leaked a lot of red juice onto the plate, which I didn't like. 215 CZK without fries. I recommend adding the "Fitness Fries" with bacon and maple syrup for 75 CZK. 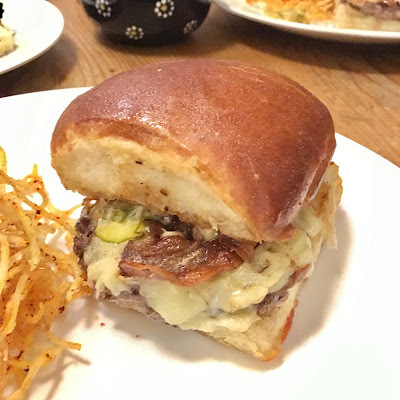 The "Cheesebacon" slider's beef had a top-notch grind, and the patty was cooked medium. It was topped with remarkably-good, melted cheddar. It came with crisp but not smoky bacon, lettuce, red onion, ketchup, and homemade mayo. It rode in on a quality bun, but suffered from sloppy construction 189 CZK for two, no fries available. Top points here for the great ground beef, cooked medium, topped with crispy, smoky bacon. There was also the best quality layout and construction: the cool, fresh toppings placed on the plate, avoiding the heat of the meat until the last minute, awaiting closure. Two things have changed since last year's model. The restaurant's flame grill was gone due to ventilation issues. I missed the extra smokiness. The bun was also changed and, in my view, not for the better. The texture was less bready, more mushy, like Wonder Bread. It also got soggy on one side due to the juiciness of the burger. I didn't detect much toasting. The bun knocked this burger down the list for me. It cost 289 CZK, with curly fries included. I had the 180g Beef Black Angus burger with caramelized onions, tangy cheddar, tomato, and lettuce. 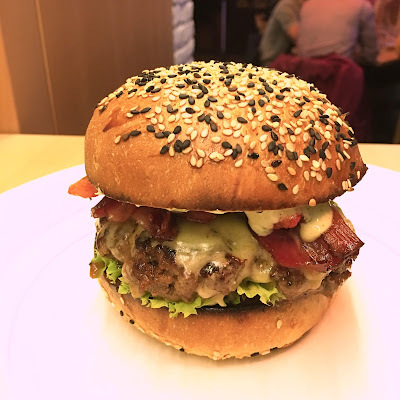 The incredibly tasty patty, tall but not too wide, was made with perfectly-ground, smoky beef on their Josper grill. It was pink in the middle, with lots of salt, but there was also some gristle. It doesn't come with bacon, but the meat was so smoky and delicious, they can get away with that. Because of its height and build, it was hard to pick up and eat, but it became more manageable once I got a good grip on it. The bun was soft but strong enough. The burger came with terrific fries. To their credit, they brought a Heinz ketchup bottle for the fries, though the burger was made with tomatoey homemade ketchup that was not too tart or sweet. The main drawbacks: way too much cucumber mayo dripping down the sides, and it was a total mess to eat. 229 CZK. This was a big, hefty burger with good ground beef, cooked medium. The one slab of Irish bacon was salty and thick, but had no smokiness. It wasn't a classic taste for a burger, hey, they had to make it Irish. The salty cheddar was unremarkable, and it had a thin slice of tomato and mixed lettuce. The bun holds this tall, weighty beast together, but it was hard to pick up and bite. There was lots of mayo on the top and bottom. Excellent crispy fries come with it, plus a bottle of Heinz ketchup, which is always a plus. One of the more expensive burgers in town at 315 CZK, but quite satisfying. 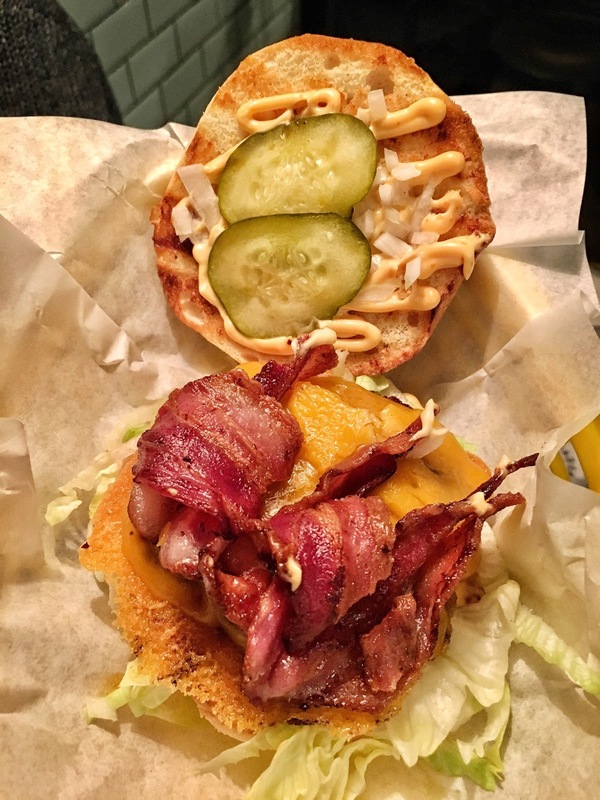 The Classic Bacon Cheddar had a relatively thin but tightly-packed patty, cooked medium. Their ground beef was full of flavor, and the crispy bacon was super. I liked their tangy English cheddar and nice sour pickles for contrast. The shredded lettuce helped with build quality. They served red onion on the side. There was too much ketchup and mayo. The Classic also comes with mustard, but I always ask them to leave it off. Three's a condiment crowd. The patty and the bacon were not as hot as should be. The soft, sturdy bun held together well, but was not really toasted. 229 CZK, fries not included. Sitting on their spectacular terrace overlooking Prague Castle was a nice way to spend a warm summer evening. Though the most expensive one on the list, the Ginger and Fred Burger was a good choice among the fancier, even pricier fare on this menu. 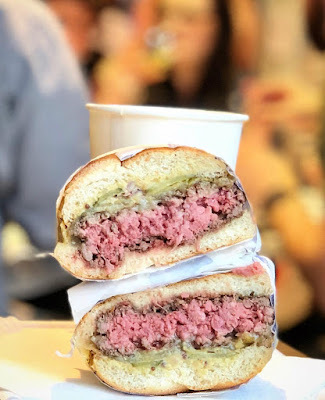 It was on the small side, but had a thick patty of terrific, smoky beef with a just-right grind. The beef rib meat was marinated in Coca-Cola. I can't say I tasted the Coke, but it was delicious. The meat's salt level was good. It was cooked medium rare and was moist-juicy good. 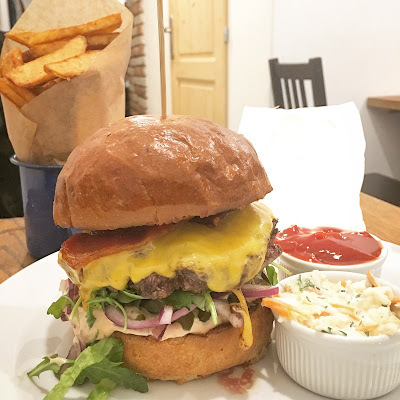 The burger was topped with mustard-mayo, mixed-leaf lettuce, and sweet, fried onions. The bun was light, springy, and colored red. The included fries were crispy and cut right. The burger was a chart-topping 398 CZK, but their website has the price now at 415 CZK. 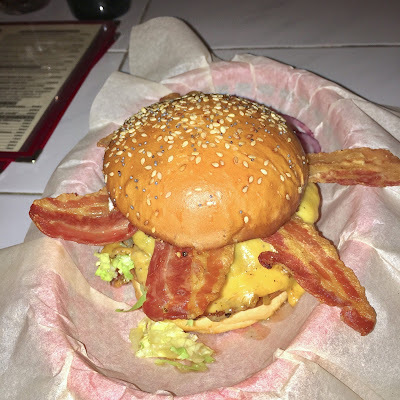 The "Dirty" Burger was delicious and unlike most others in town. The difference was its dry-aged Angus, cooked medium, with a unique, beefy flavor from hanging around in a climate-controlled fridge. The meat had a proper, coarse grind. The burger was topped with thick, salty bacon, assertive, tangy cheese, and sour pickle slices, plus a special sauce with a kick to it. I was glad it didn't have lettuce or tomato to clutter up the taste. I loved the square potato bun, which was rich and weighty, with a hint of sweetness. It all gave way easily to a bite. The fried string potatoes were hard to pick up and eat. I could live without those. 220 CZK. 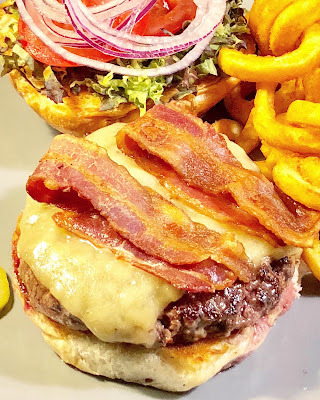 I had The Tavern Classic Bacon-Cheddar burger. The American owners also run The Tavern restaurant mentioned earlier on the list. This one wins the bacon prize with top-level quality and certainly the greatest quantity. The ninja-star bacon placement was awkward. Someone could get porked in the eye (sorry, couldn't resist). In all seriousness, it was a pain to break the ends off and put all the bacon under the bun where it belonged. But in this case, taste beats looks and convenience. The salty patty, with a good grind, was not as tightly-packed as The Tavern's version. U Kurelů's had better balance overall. The burger had two slices of English cheddar. I loved the soft, light bun and great sour pickles. It comes with mustard, mayo, and ketchup, but I always tell them to delete the mustard. It cost 219 CZK without fries. I got the smaller 140g American Dream burger rather than the 200g version. Great beef, great grind, cooked a perfect medium. Excellent chewy, smoky bacon was hidden under the melted cheese. The toasted bun was good quality, but it was too big for the smaller patty, giving it an awkward look. I enjoyed the slow burn of the Sriracha mayo and liked the taste of the cucumber-like half-sour pickles. The toppings were scattered rather haphazardly, but the classic flavors mixed together well. 195 CZK, without fries, which cost 55 CZK extra. Ketchup was 10 CZK extra, and it wasn't even Heinz. 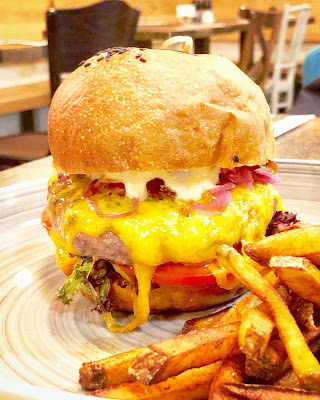 Annoyances aside, my notes do say, "One of the best patties in town." Start to finish, I enjoyed every bite of the Royal Bacon Cheeseburger. Crispy, smoky bacon topped a medium-cooked 170g patty packed with flavor. There were delicious, freshly-grilled, sweet caramelized onions contrasting with crunchy sour pickles. The cheese had a smoky tang. It was all wrapped up in a big but light and fluffy toasted bun. I didn't miss lettuce or tomatoes. It was not easy to bite, but not messy at all to eat –- no dripping, slipping, or sliding. As always, the homemade ketchup was offbeat, with its strong Worcestershire sauce influence. The patty was tightly-packed, and there was a lot of mayo. 189 CZK without fries, or 229 CZK with fries, coleslaw, and parsley mayo. I always go without. Their big burger and a beer is more than enough for me. Their aged beef burger with cheese was wonderful. 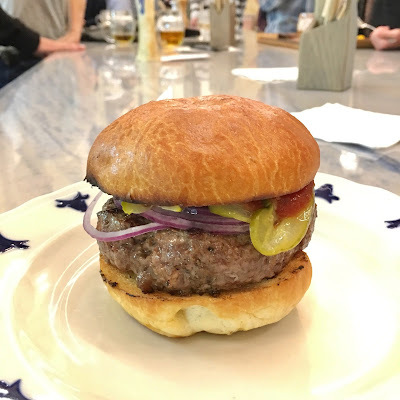 This beautiful butcher's palace opened in 2017, and I went back for the burger three times. The patty was thick, with a perfect grind and a satisfying, seared crust from the grill. With a hint of smoke and the right amount of salt and fat, it had the best beef flavor of any burger I had this year. The patty was juicy but not messy. It was served on a decent toasted bun, but nothing fancy. 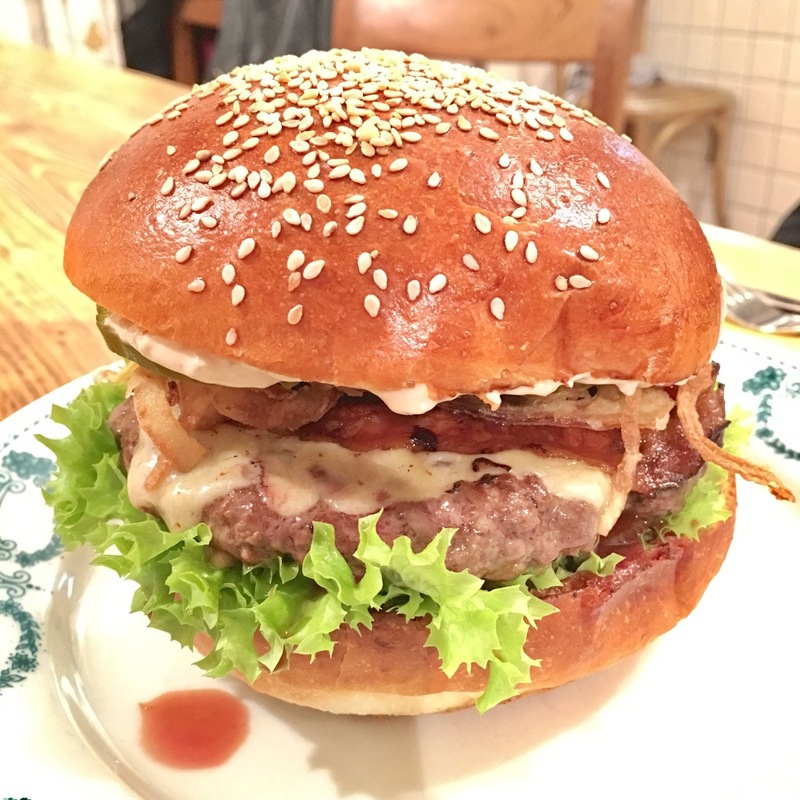 The burger was topped with long-cut sweet/sour pickles and strong red onions. Normally, it comes with mustard, but I always insist they change it for their homemade ketchup. 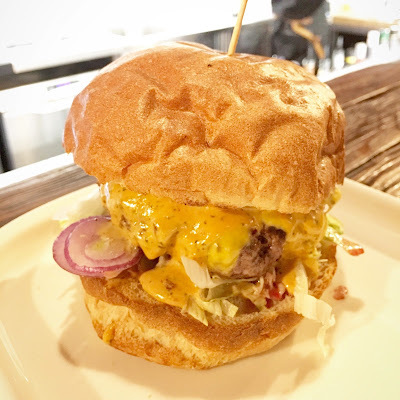 This burger could be number one, except for one big and consistent flaw: gristle. There were many unchewable pieces in every burger. It was a mark of how great the taste was that I'd still rate it this high. I must add that the restaurant, though good-looking, would get so unpleasantly busy that it reminded me of a bus station. 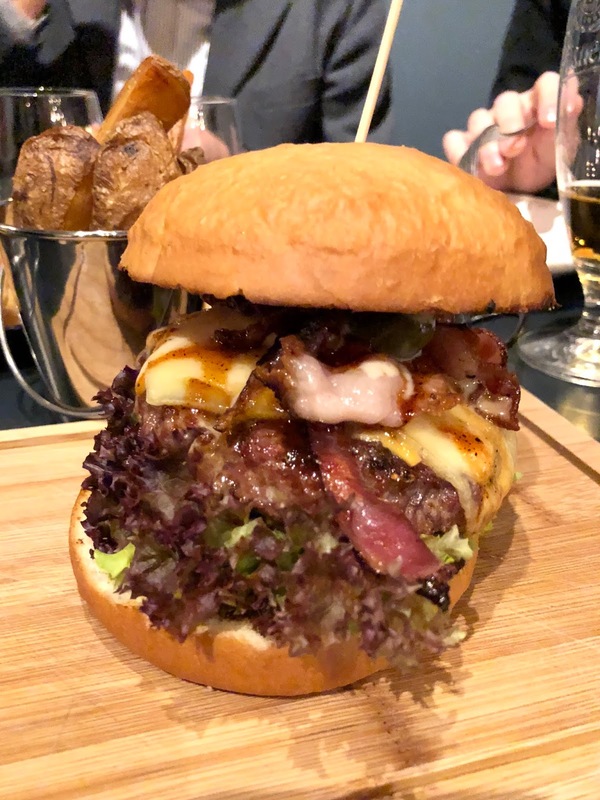 The burger was 218 CZK, and fries were not an option. What a difference a year makes. I don't know what went wrong last year, but it was not good on a number of levels. The 2017 visit was like night and day. The Hillbilly Burger's 160g tender patty had the right grind, was cooked medium, and was easy to bite. Just the right amount of salt brought up the flavor. Some of the salty bacon was overcooked and chewy. There was an amazing, buttery, perfectly-toasted bun. It was soft on top and crunchy on the inside. It was a master class on how a bun should be done. 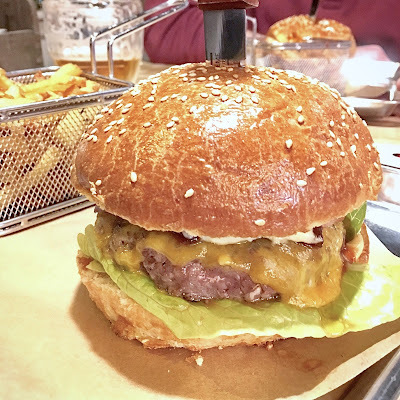 The burger was topped with cheddar, rucola, lots of onions, a tasty, sweet mayo, and ketchup combo, mixed with chopped pickles. It all combined into a classic package that keeps this place constantly packed. 180 CZK, plus 40 CZK for very good, crispy steak fries. They charged an extra 20 CZK for a dish of Heinz ketchup to dip my fries in. Mr. HotDog, how do I love thee? Let me count the visits. I've probably been there at least 10 times this year, more than any other place, by far. That's my metric for judging my favorite. 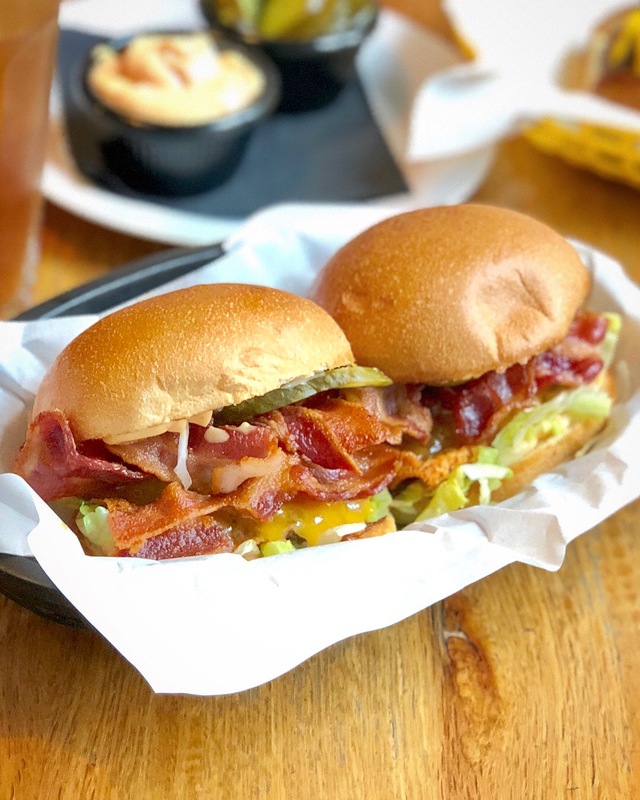 My obsession with their Bacon Cheese Slider has not waned since last year, making Mr. HotDog the second two-time winner in the history of this list. I hesitate to call it a slider as they do. It's really too large for slider status. It's a small burger. The bacon was great – crunchy, chewy in a good way, smoky – and there was lots of it. Their buns are a work of art – pleasing to both the eye and the palate. The beef, though ground a little finely for my taste, is usually cooked medium and tastes wonderful. I love their sour pickles and tangy slider sauce. They keep it all in harmony with chopped onions and shredded lettuce tucked neatly inside the bun. This is well-balanced construction. For me, it's just the perfect burger package for 99 CZK, fries not included. I also love their hot dogs, McDonald's-like fries, onion rings, ice tea, coriander martinis, and sea dogs made with delicately-fried cod. Special dishes they offer, like soups and desserts, show that this is not just a fast food spot. These people are serious cooks, and they'll be tough to beat in 2018. 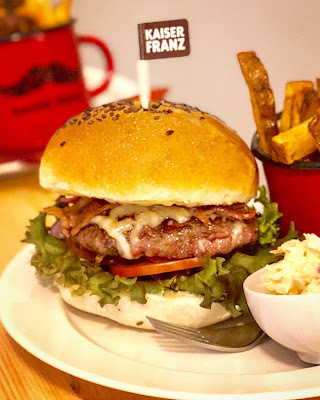 Thanks to Bohemian Foodgasm for the great photo.